Imagine if helping children in foster care was as easy as eating dinner at Wendy’s®. Well, good news! It is! 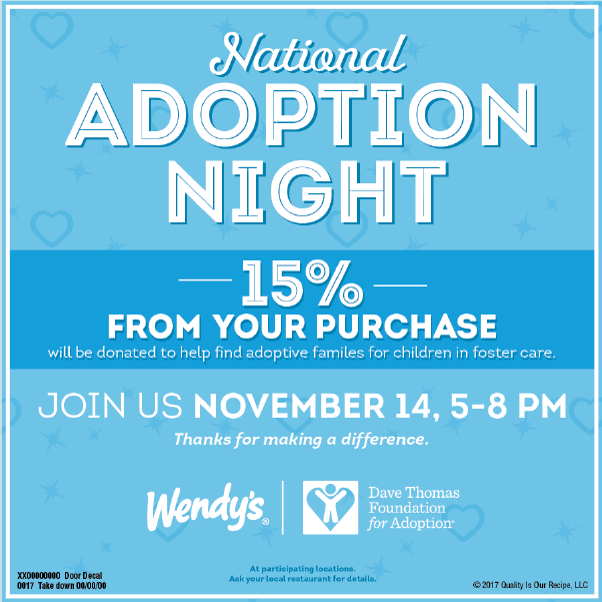 On Tuesday, November 14 between the hours of 5:00 pm and 8:00 pm, 15% of restaurant sales from customers who visit a participating Wendy’s restaurant for dinner will be donated to the Dave Thomas Foundation for Adoption® in recognition of National Adoption Month. These funds will support the DTFA’s continued efforts to find forever homes for children waiting in foster care. Your visit will help kids like Dalton and Dawson, who spent over three years in foster care before being adopted by their forever family. Thanks to the Dave Thomas Foundation for Adoption and their Wendy’s Wonderful Kids® recruiter, Dalton and Dawson were adopted together and are now thriving. Dawson loves to tell people that he’s a “Wendy’s kid”, and stories like theirs would not be possible without support from our Wendy’s customers. Plan on being part of something special – join us for dinner on November 14! Click here to see more photos, read more blogs, and sign up for The Square Deal notifications.